Celebrate love in the Lone Star State with an overlapping parade of cow-boots. These Boots Were Made for Framing. Even a city slicker won't be able to resist this print. 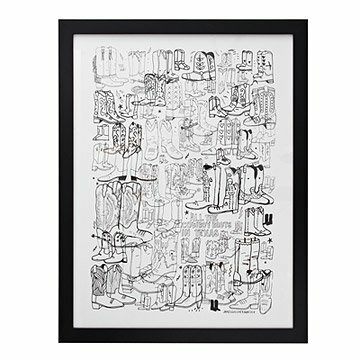 James personifies the Lone Star State with an overlapping parade of cow-boots, of all sizes, shapes and patterns. A fun way to relive a trip or to spur the memory your old stomping grounds, this hand-pulled one-color silkscreen on RFK Rives paper brings the spirit of Texas to your very own home. Handmade in Brooklyn. Perfect reminder of our Texas roots! My daughter moved to Dallas and recently purchased a home.I sent this as a house warming present. She absolutely loves it! It was just how it looked on line so very pleased. The kids could not get over how awesome the picture is. Delivery was perfect and I was kept informed of the entire delivery process. I have uncommongoods bookmarked and will definitely be a repeat customer because the gifts are really awesome. Thanks for sending me your magazine.